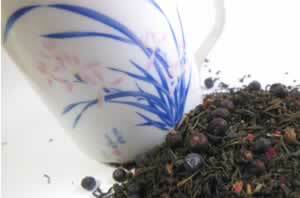 Blending green tea with berries not only gives your taste buds a treat, you create a dynamic duo of antioxidant power. Recipe Instructions: Herbal Tea : Dried berries take a bit longer to infuse than tea leaves, so to brew them to perfection we need to make this a 2 step process. Put tea leaves in teapot/strainer. Pour the berry decoction over the tea leaves and leave to infuse for 3 to 5 minutes.